Kinetico Signature Series water softeners are classically Kinetico: dependable, efficient, non-electric and rugged. Powered completely by water, this softener solves everyday water problems reliably and efficiently without the hassle of timers or computers. Twin tanks take turns regenerating so your home is never without soft water. Systems clean themselves with soft water too, so your softener will perform better and last longer. 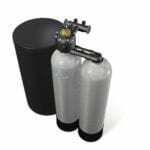 Signature Series water softeners also have a comprehensive warranty, you can rest assured that your water will be soft and iron-free for years to come.